For other places with similar names, see Londonderry (disambiguation) and Derry (disambiguation). "Help comes from the Lord"
Contae Dhoire is the Irish name; Coontie Lunnonderrie is its name in Ulster Scots. The place name Derry is an anglicisation of the old Irish Daire (Modern Irish Doire), meaning "oak-grove" or "oak-wood". As with the city, its name is subject to the Derry/Londonderry name dispute, with the form "Londonderry" generally preferred by unionists and "Derry" by nationalists. British authorities use the name "Londonderry", while "Derry" is used by the Republic of Ireland. Mountsandel located near Coleraine in County Londonderry is "perhaps the oldest recorded settlement within Ireland". At an early period, what became the county of Coleraine was inhabited by the O'Cahans, who were tributary to the O'Neills. Towards the close of the reign of Elizabeth I their territory was seized by England, with the purpose of checking the power of the O'Neills, and was made the county of Coleraine, named after the regional capital. This new county would comprise the then County Coleraine—which consisted of the baronies of Tirkeeran, Coleraine, and Keenaght—and at the behest of The Irish Society the following additional territory was added: all but the south-west corner of the barony of Loughinsholin, then a part of County Tyrone, as it had sufficient wood for construction; the North East Liberties of Coleraine, which was part of County Antrim and the City of Londonderry and its Liberties, which were in County Donegal, so that they could control both banks of the River Foyle and River Bann. Vintners, based at Vintner's Hall, later called Vintner's Town (present-day Bellaghy) in the barony of Loughinsholin. The highest point in the county is the summit of Sawel Mountain (678 metres (2,224 ft)) on the border with County Tyrone. Sawel is part of the Sperrin Mountains, which dominate the southern part of the county. To the east and west, the land falls into the valleys of the Bann and Foyle rivers respectively; in the south-east, the county touches the shore of Lough Neagh, which is the largest lake in Ireland; the north of the county is distinguished by the steep cliffs, dune systems, and remarkable beaches of the Atlantic coast. 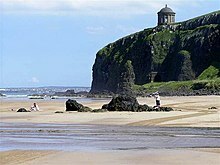 The county is home to a number of important buildings and landscapes, including the well-preserved 17th-century city walls of Derry; the National Trust–owned Plantation estate at Springhill; Mussenden Temple on the Atlantic coast; the dikes, artificial coastlines and the bird sanctuaries on the eastern shore of Lough Foyle; and the visitor centre at Bellaghy Bawn, close to the childhood home of Nobel laureate Seamus Heaney. In the centre of the county are the old-growth deciduous forests at Banagher and Ness Wood, where the Burntollet River flows over the highest waterfalls in Northern Ireland. In 1973 counties ceased to be a unit of administration within Northern Ireland, being replaced by district councils. These councils were: Derry City Council, Limavady Borough Council, and Magherafelt District Council, most of Coleraine Borough Council, and part of Cookstown District Council. After a reduction in the number of councils in Northern Ireland in 2011, County Londonderry is divided into three cross-county councils: Causeway Coast and Glens, Derry and Strabane, and Mid-Ulster District. 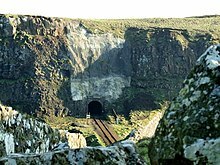 Downhill Tunnels near Castlerock railway station. Translink provides a Northern Ireland Railways service in the county, linking Londonderry Waterside railway station to Coleraine railway station (with a branch to Portrush on the Coleraine–Portrush railway line) and onwards into County Antrim to Belfast Central and Belfast Great Victoria Street on the Belfast-Derry railway line. There is also the Foyle Valley Railway, a museum in Derry with some rolling stock from both the County Donegal Railway and the Londonderry and Lough Swilly Railway, and is located on the site of the former Londonderry Foyle Road railway station. The Londonderry and Lough Swilly Railway continued as a private bus company based in the city but operating predominantly in County Donegal until it closed in 2014. Bus services are now provided by Ulsterbus. The oak leaf which represents the county's nickname. 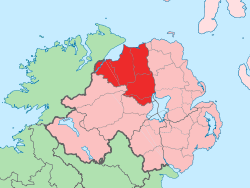 In Gaelic games, the GAA county of Derry is more or less coterminous with the former administrative county of Londonderry, although teams from the neighbouring counties of Tyrone, Donegal and Antrim have occasionally played in Derry competitions, and vice versa. The Derry teams wear the colours red and white. There are many club teams competing in up to five leagues and three championships. The county team has won one All-Ireland Senior Football Championship (in 1993) and five National League titles. Hurling is also widely played but is not as popular as football. However, the county team is generally regarded as one of the top hurling sides in Ulster and in 2006 won the Nicky Rackard Cup – the third tier hurling competition in Ireland. In association football, the NIFL Premiership, which operates as the top division, has two teams in the county: Coleraine F.C. and Institute F.C., with Limavady United F.C., Moyola Park F.C., Portstewart F.C. and Tobermore United F.C. competing in the NIFL Championship, which operates as levels two and three. Derry City F.C. play in the Premier Division of the League of Ireland after leaving the Northern Ireland structures in 1985, having resigned from the Irish Football League at the height of the Troubles because of not being allowed play their home games at the Brandywell due to security concerns from other clubs. The Northern Ireland Milk Cup was established in 1983 and is regarded as one of the most prestigious youth football tournaments in Europe and the world. The competition is based at Coleraine and involves several other towns and villages in the county – Limavady, Portstewart and Castlerock – and in neighbouring County Antrim – Ballymoney, Portrush, Ballymena and Broughshane. The event, held in the last week of July, has attracted teams from 56 countries around the world including Europe, the USA, Africa, the Far East, South America, the Middle East, Australia, Russia, New Zealand and Canada. Some of the biggest teams in the world have entered including Premiership giants Everton, Liverpool, Manchester United, Chelsea, Tottenham Hotspur as well as top European teams such as Feyenoord, F.C. Porto, FC Barcelona, Benfica, Bayern Munich and Dynamo Kiev. In rowing, Richard Archibald from Coleraine along with his Irish teammates qualified for the Beijing 2008 Olympics by finishing second in the lightweight fours final in Poznań, thus qualifying for the Beijing 2008 Olympics. Another Coleraine rower Alan Campbell is a World Cup gold medallist in the single sculls in 2006. Six FM (in the south of the county). ^ Key Statistics Tables Archived 27 November 2007 at the Wayback Machine 2001 Census combined for Coleraine, Derry, Limavady & Magherafelt. ^ "Northern Ireland" (PDF). Ministry of Defence (United Kingdom). Retrieved 28 October 2010. ^ Banagher and Boveagh Churches Archived 30 August 2011 at the Wayback Machine Department of the Environment. ^ a b "NISRA - Northern Ireland Statistics and Research Agency (c) 2015" (PDF). Archived from the original (PDF) on 27 November 2007. ^ Delanoy, Werner; et al. (2007). Towards a Dialogic Anglistics. LIT Verlag. p. 38. ISBN 978-3-8258-0549-4. ^ "doire". téarma.ie – Dictionary of Irish Terms. Foras na Gaeilge and Dublin City University. Retrieved 18 November 2016. ^ Blackie, Christina (2010). Geographical Etymology. Marton Press. p. 61. ISBN 978-1-4455-8286-3. ^ A.E.P. Collins (1983), "Excavations at Mount Sandel, Lower Site", Ulster Journal of Archaeology vol. 46 pp1-22. JSTOR preview. ^ Moody, Theodore William; Martin, Francis X.; Byrne, Francis John (1 January 1984). "Maps, Genealogies, Lists: A Companion to Irish History". Clarendon Press – via Google Books. ^ Curl, James Stevens (2001). "The City of London and the Plantation of Ulster". BBCi History Online. Retrieved 10 August 2008. ^ Robinson, Philip (2000). the Plantation of Ulster. Ulster Historical Foundation. ISBN 978-1-903688-00-7. ^ Walter Harris. "Hibernica: or, Some antient places relating to Ireland". Retrieved 30 June 2016. ^ "Place Names NI - Home". ^ "SuperCupNI (formerly NI Milk Cup est. 1983) - Homepage". ^ "John Trask On U.S. U-18 Staff At Northern Ireland Milk Cup". 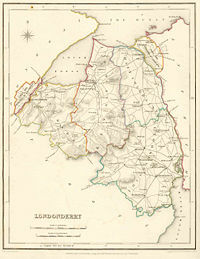 Wikimedia Commons has media related to County Londonderry. Wikivoyage has a travel guide for County Londonderry.